← Progress of the Seasons Journal: 29 April, 1832-1862. Progress of the Seasons Journal: 30 April, 1832-1862. We were down in Westchester County yesterday and just want to confirm that Spring has indeed arrived down there: Sassafras, Service Berry, Sugar Maple, Norway Maple, Oaks, Cherries, Shepherd’s Purse, Dandelions all in Flower; Red Maple forming samaras. Yellow-rumped Warblers in the Woods. Up in New Lebanon, it was apparently the “Day of Turtle” with numerous Turtles first basking. Here is the historical phenology report from the ‘Progress of the Seasons Project’ for 30 April. A typical sight in our landscape at the moment – a flurry of Forsythia. Not so 150 years ago. It is sometimes harder to realize what isn’t there than what is. In reading over the historical reports one sees numerous mentions of Lilacs and Hyacinths in bloom. And yet today, driving around the landscape, it is the yellow of Forsythia that stands out in the hedges. However, there is not a single Forsythia record in the historical data… what gives? Red Maple already forming its seeds, also yesterday in Westchester County. Evidently, ‘what gives’ is the fact that our common hedge Forsythia was not widely introduced into ornamental North American horticulture until the end of the 1800s. The historical observers didn’t overlook it, it simply wasn’t there to look at! As you read our reports, it’s worth thinking about who else might be prominent in their absence – candidates would be welcome. 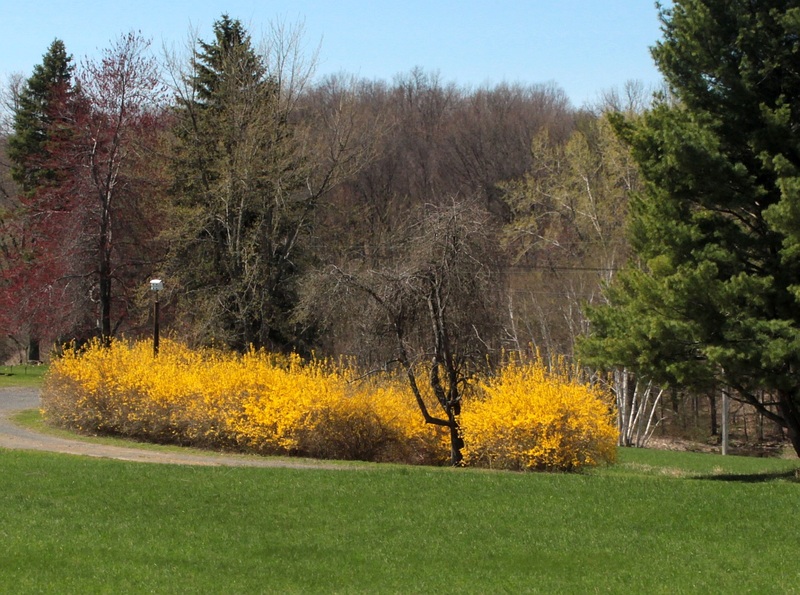 For more on Forsythia history see Wikipedia and Arnoldia, the journal of Harvard’s Arnold Arboretum. 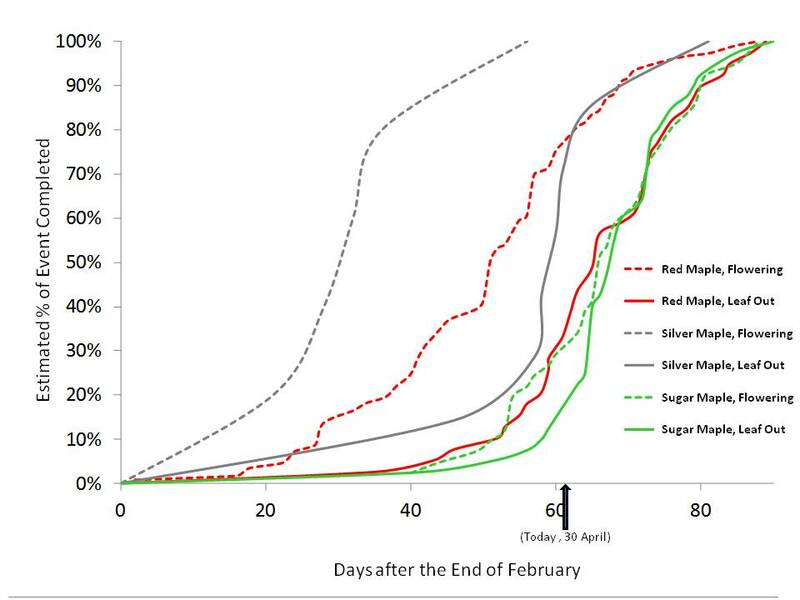 The graph for today (more coming manana) summarizes our historical data for Maplephenology, and it reveals the different strategies of our three common Maple tree species, Red, Sugar and that stream-bank resident, Silver. The graph is based upon all data (all locations, all dates) in our historical records and shows the cumulative statistics on the flowering and leaf-out of these three species. Sugar Maple blooming in Westchester County yesterday. It’s clear that Silver Maple gets out of the blocks early, being the first species to begin flowering. However, leaf-out doesn’t actually occur until substantially later. 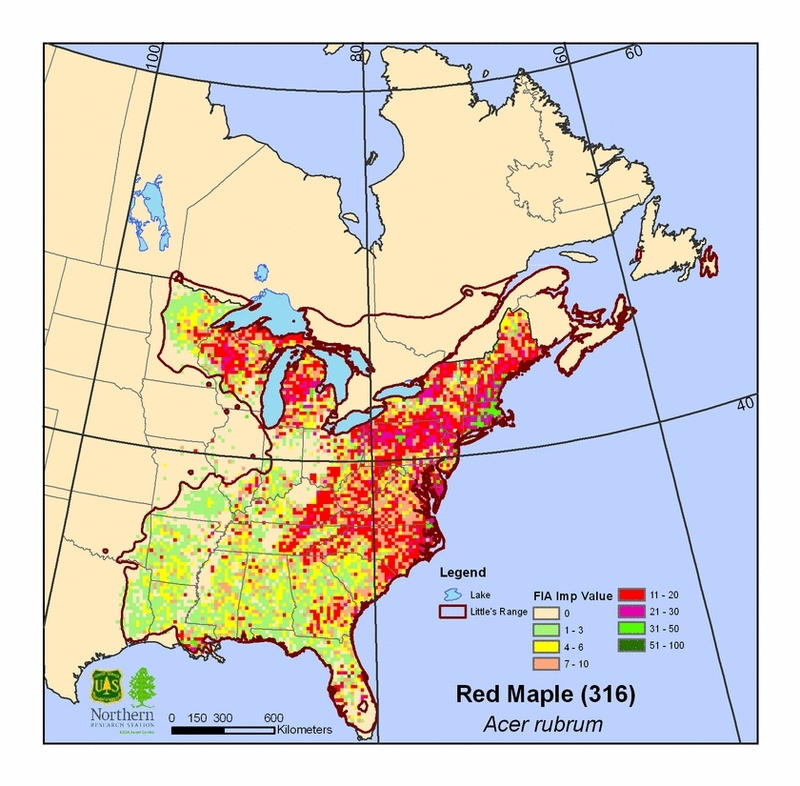 Red Maple follows the same pattern of flowering noticeably before leaf-out, although there is not nearly as much separation between the two events as for Silver Maple. 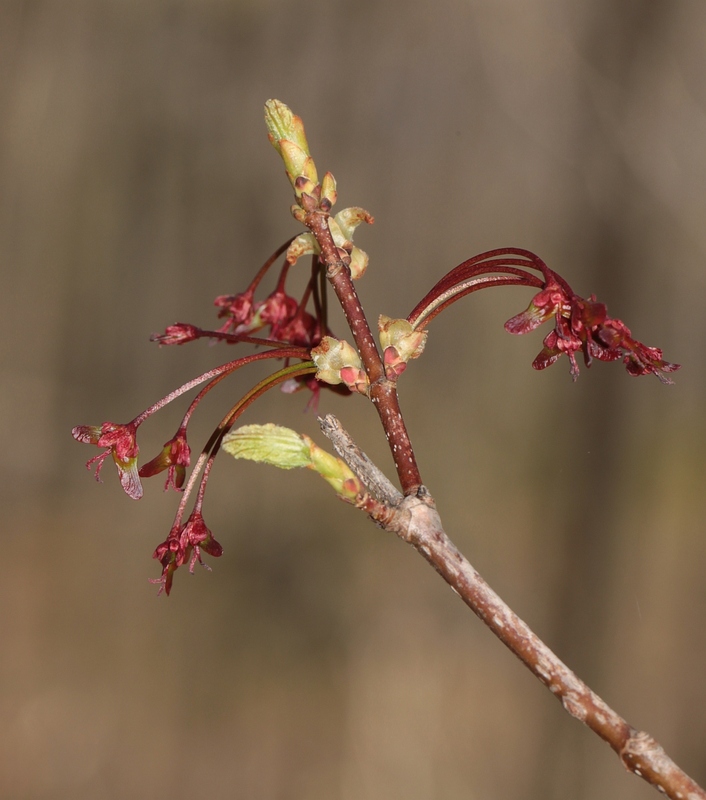 Finally, round about the end of April, Red Maple begins leaf out and Sugar Maple plays catch up by essentially leafing out and flowering at the same time. 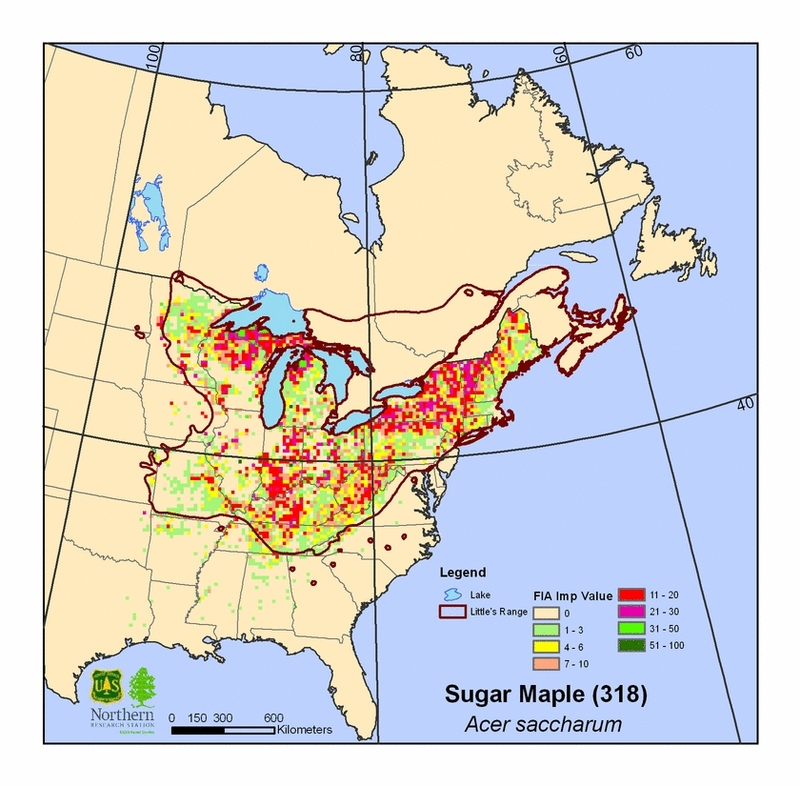 Obviously, as judged by the start of the sugaring season, Sugar Maple isn’t asleep but for some fine reason of evolutionary history it doesn’t visibly arrive at Spring until relatively late. 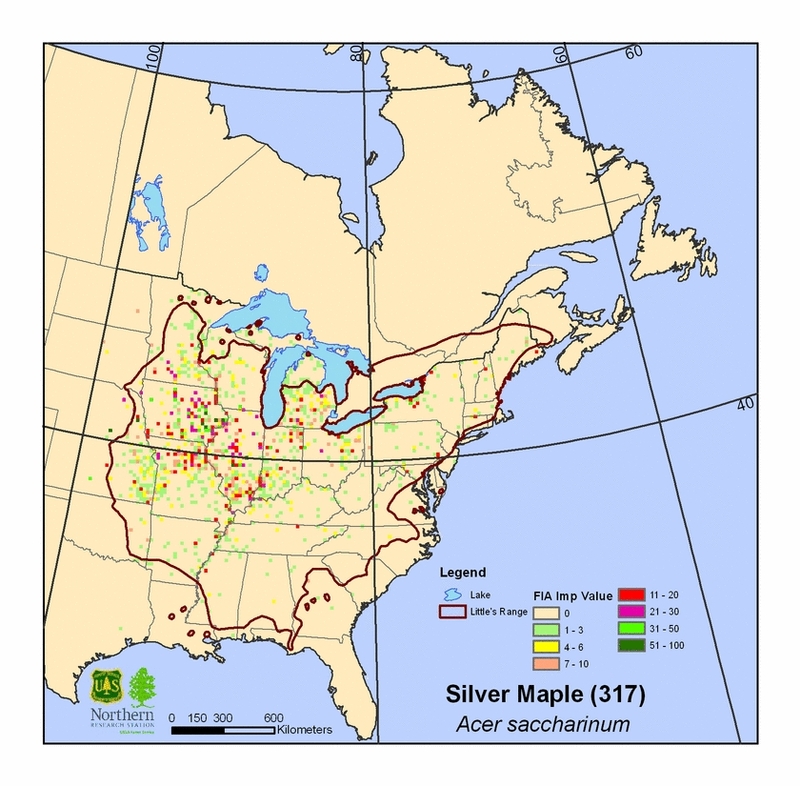 Perhaps Sugar Maple as the most northerly of our Maples (see attached Forest Service Maps) has evolved delayed flowering because it reduces the perils of a late frost. Herbs: In 1855, Spencertown’s year’s first Ox-Eyed Daisy was reported in leaf. The flowers of Silver Maple from early April of last year. leaves, in 1858. Noted in Spencertown, 1855: Elderberry and American Elm are blossoming. In 1832, Kinderhook reported Shadbush in flower on this day. Birds: Whippoorwills had arrived in Fishkill Landing in 1858 and Barn Swallows appeared in Kinderhook, 1836. Agriculture: On this day in Poughkeepsie, 1845, residents commenced their year’s first planting of corn. A decade later, on this day, Plum Trees first leafed in Spencertown. Herbs: Both Dandelions and Trout Lily had first blossomed. Woodies: Two reported Dogwoods in bloom. Single reports included Hornbeam and Horse Chestnut in leaf and Choke-Cherry, Lilac and Spice Bush blooming. Birds: Three reports of Swallows arrived, a lone report of a first arrived Whippoorwills and North Salem noted its year’s first Bobolink in 1847. Other Critters: The arrival of Butterflies was reported. Agriculture: Strawberry, Pear, and Currants were each mentioned as first blossoming in three reports. The day hosted two accounts of flowering Apple Trees; Apricots, Gooseberry and Cherry had also bloomed and Blackberry and Pear had put forth leaves. Agriculture: Kingston had harvested Asparagus on this day in 1802. 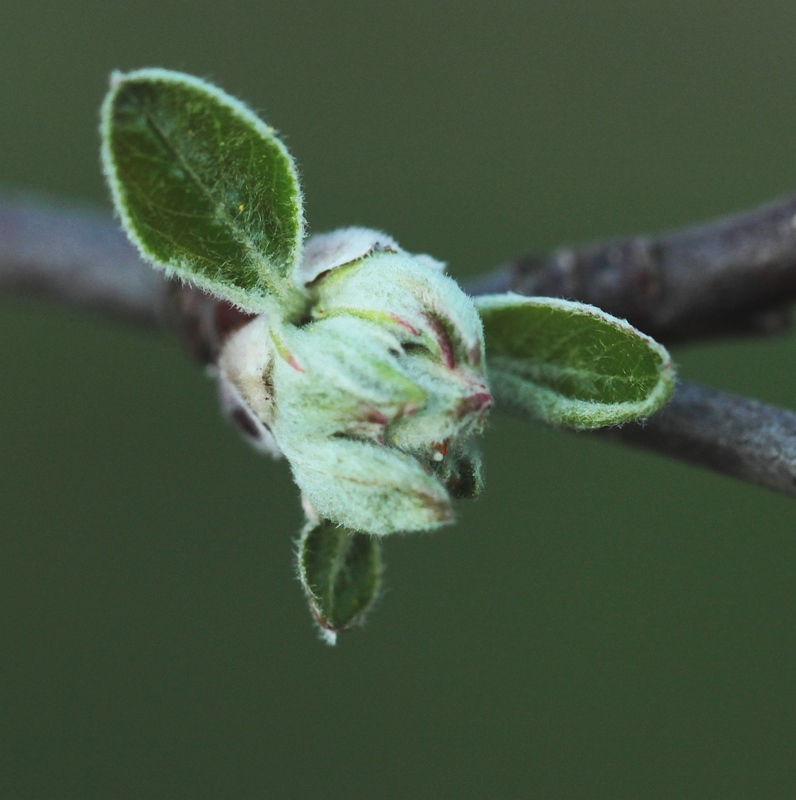 Apple just starting to leaf out here in Harlemville. 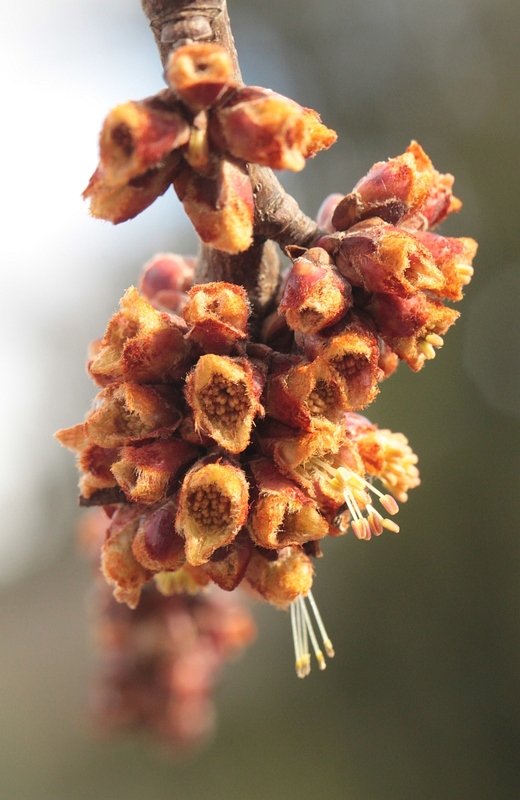 Woodies: Reported in flower was Red Maple and Horse Chestnut. Birds: Swallows had first arrived. reported in Washington County, 1844. Agriculture: Strawberry reported as flowering. Herbs: Reported Saxifrage in leaf; Marsh Marigold and Trailing Arbutus had displayed their flowers. 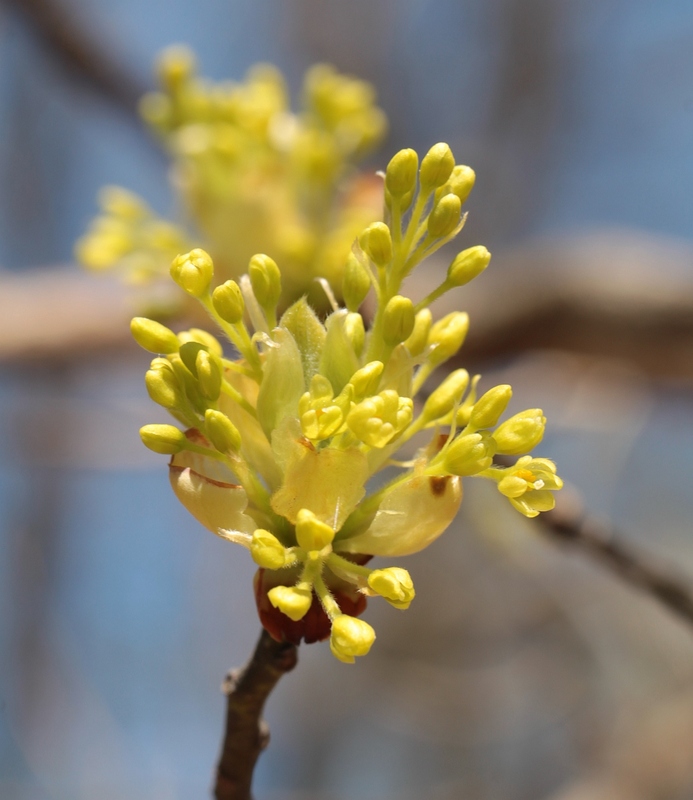 Woodies: Blossoming Elm trees reported in Lowville. Birds: Both Barn Swallows and Martins appeared in 1842 and 1837, respectively. Other Critters: The croaking of frogs was reported. Agriculture: A singe report of Red Raspberry in leaf. Herbs: Two locales reported the blossoming of Hyacinth on this day. 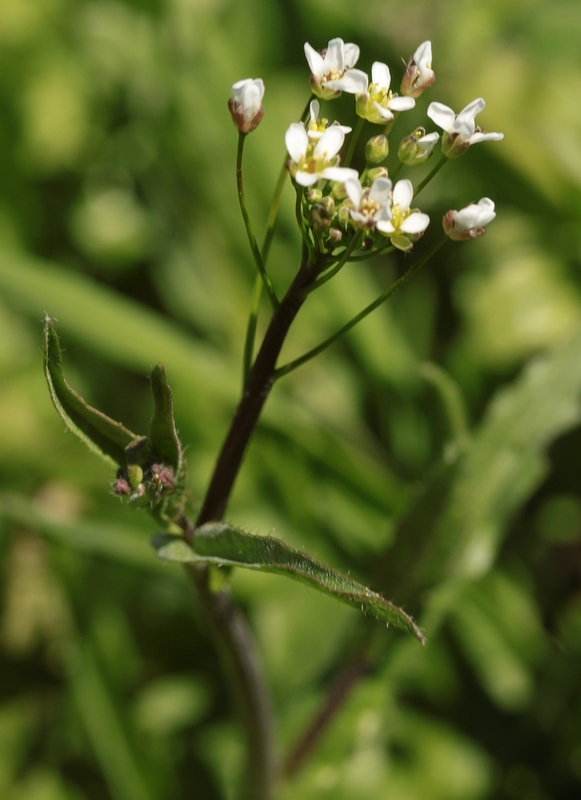 Shepherd’s Purse, the introduced field weed. It’s in the Mustard family and gets its name from the purse-like seed capsules that will later form. Woodies: Year’s first flowering Lilac seen in Canajoharie, 1838. Birds: Barn Swallows arrival noted in two reports. Martins and Bobolinks first appearances also reported. Agriculture: Solo reports of flowered Currants, Plums and Strawberries. Herbs: Reported blossoming was Two-Leaved Bishop’s Cap, Snow Drop, Marsh Marigold and Little Bluet. Woodies: Hornbeam and Red Maple had flowered. Birds: Oswego County noted the year’s first Barn Swallow in 1851. Other Critters: First heard croaking of Frogs. Agriculture: Red Currant and Plum trees both reported as blooming. Herbs: Spring Beauty, Daffodil and Trout Lilly blossomed. Birds: Both Barn Swallows and Martins appeared. Agriculture: Blossoming Strawberries, Gooseberries and Cherries each reported twice. Additionally, Apple Trees and Currants flowered. Herbs: Reported Hepatica and Blue Cohosh in flower. Agriculture: The blossoming of Cherry Trees occurred on this day in three different years in Monroe County. Woodies: Williamsville noted its year’s first Sugar Maple putting forth leaves. Agriculture: The blooming of Peach Trees observed. Herbs: Reported Sheppard’s Purse in bloom.